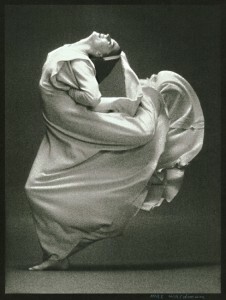 Choreography and costume design by Martha Graham. Set design by Isamu Noguchi. Close collaborations with designers and composers to develop a cohesive atmosphere. Graham worked with sculptor Isamu Noguchi and composer Louis Horst on Frontier. They were both important ongoing collaborators for her (particularly Horst, who was her teacher, advocate, lover, and collaborator for many years). It has been said that in her collaborations, Graham was always the director. In this context, she believed the other art forms should ultimately serve the vision of the dance. Exploration of national identity through the eyes of archetypal characters from history. In this dance, a pioneer woman surveys a vast Western landscape (suggested by the sparseness and broadness of Noguchi’s minimalist set). The dancer is a representation of Western expansion: Americans’ progress into the unknown and their hunger for space. As always, Graham imbues this generic woman with a remarkably intimate emotional expression and individual identity. This piece foreshadows the Pennsylvanian pioneers of Appalachian Spring (1944). The use of costume to evoke a setting, to imply a character, and to complement the dance vocabulary. In Frontier, the dancer wears the long-skirted dress closely identified with Graham’s costume designs (she always designed the costumes for her own works). In this case, the dress also refers to the style of dress of 19th century pioneer women. The light pink hue—colors were carefully considered by Graham—suggests optimism and freshness. In Graham’s method, the contraction and release of the torso (a motion organically derived from the act of breathing) is the center from which all of her sweeping, expressive movements extend. The dress accentuates the movements of the dancer, particularly by elongating the motion of her limbs. The use of the floor as a plane for expressive movement. Graham was intentionally anti-ballet and anti-establishment, and one of the many ways in which she radically broke from ballet aesthetics was the use—rather than the denial—of gravity. (In this, she was apparently influenced by some avante garde German dance.) She often danced while sitting, or fell gracefully onto the ground. The designs that Isamu brought to Frontier came from our discussion of the hold the frontier had always had on me as an American, as a symbol of a journey into the unknown. Traveling to California by train, the endless tracks were to me a reiteration of that frontier. When at last I asked Isamu for an image of them in my dance, he brought to me the tracks, as endless ropes into the future. I had the idea of Frontier in my mind as a frontier of exploration. a frontier of discovery, and not one of limitation. (…) It makes me triumphant to think that nothing lasts but the spirit of man and the union of man. People cross the border from East to West to shake the hands of those they have not seen before. In a way, they have become each others’ frontier. Mazo, Joseph H. Prime Movers: The Makers of Modern Dance in America. Princeton, 2000. Reynolds, Nancy, and Malcolm McCormick. No Fixed Points: Dance in the Twentieth Century. Yale UP, 2003.